When legends release new material, it can be quite disappointing. For instance, when Metallica released Load, most heavy #metal fans were let down immensely. The crunch was gone, the complexity was all but absent, and years of over touring had taken a toll on singer James Hetfield much sooner than his age would suggest. 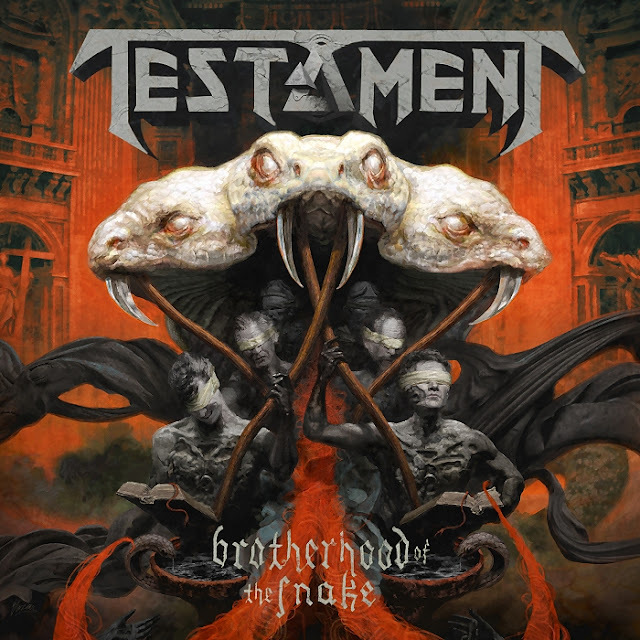 While the mighty Met have managed to redeem themselves since then, thankfully #Testament has yet to release a slab of sub par material, and thankfully their newest, “#Brotherhood of the Snake” keeps that tradition in tact. If anything, with guitarist Eric Peterson at the songwriting helm, they may have just released the most exciting metal album of the year, if not of their career. The title track is nothing short of a drumming journey into complexity, style, and panache. This is highlighted in the first breakdown following the chorus of, “Brotherhood of the Snake”. The signature half growl/half shout with an extra helping of “real” singing talent that is Chuck Billy is on full display, along with a new shriek element on the bridge that is quite unlike anything that he has ever done prior. One of the recognized guitar greats of our lifetime (as seen not only in Testament, but also in some “Trans Siberian Orchestra” (1) productions), Alex Sholnick has never sounded better or more crisp. His solo's are cascading masterpieces that often augment chords in a way that is done by no one else today. This is seen clearly on the albums standout track, “Seven Seals”. Using an elaborate 3/4 over 4/4 time signature in most of the song gives it a charging, forward moving feel that works brilliantly with lyrics that are easily the most powerful in Testament's impressive catalog. It tells the story of the Book of Revelations from start to finish in a way that could be the definitive soundtrack to the end of the world. It is not known if singer Chuck Billy is Christian or not, but having survived cancer, he certainly has seen the darkest moments of this life. This reflection seems clear on "Seven Seals", which should not be missed by any true fan of metal. This song will win “Best Metal Song of the Year" awards if there is any justice left in the world. Testament has also worked in surprises, such as in the song, “Canna-Business”. As the name implies, the songs about the budding business of marijuana as medicine, as well as recreation. This song hearkens back to the classic thrash sound that they helped create on such platters as “New Order” and “Souls of Black”. This needs mentioned because they have not relied on that by-the-numbers approach as some bands have. As a matter of fact, if “Brotherhood of the Snake” was played for someone who had never heard the band, they could easily think that Testament had just come out. The ever present drumming wizardry of Gene Hoglan and bassist Steve DiGiorgio see to it. “Centuries of Suffering” also tell albums tale of evil snake-like creatures that history suggests actually existed to harm the souls of men. It is apologetically fast, yet it leaves plenty of room for grace and inflection. This could be David Icke's bedtime story if he should ever become an insomniac. This track puts the gear in fifth, the peddle to the floor, and prays that one is properly belted in. It will be interesting to see if the Grammy's take notice of Testament. It was the Grammy's who not only gave Jethro Tull “Best Metal Award” during the years that Metallica's masterpiece, “One” was released many years ago, but they dropped the ball last year by choosing Ghost (?) over amazing releases by Slipknot, Judas Priest, and In This Moment! With that in full and painful recall, it may just be that the Grammy's do not give this CD – which charted on Billboard at 20 – the true credit that it deserves. Just the same, “Brother Hood of the Snake” is a must own for anyone who cherishes technicality, top rate musicianship, and lyrics that occupy the mind with new insights. DiGangi, Samuel. "Testament Return to the Heavy Metal Music Scene in Solid Form." Blasting News. Accessed November 21, 2016. http://us.blastingnews.com/showbiz-tv/2016/11/testament-return-to-the-heavy-metal-music-scene-in-solid-form-001272335.html.